Promote your dealership with these effective advertising tools. These items come with our professional Artwork assistance to walk you through the process from design proofing to prompt delivery. What better way to get more customers into your dealership than using promotional license plate frames and hitch hiders? 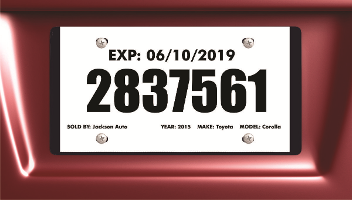 Our license plate frames and hitch hiders are made in the USA from high quality enviornmentally friendly recycled plastic. We can turnaround custom frame plate and hitch ad graphics in 24 hours. How many sells are you losing to your competition by not using plate frames and hitch covers?